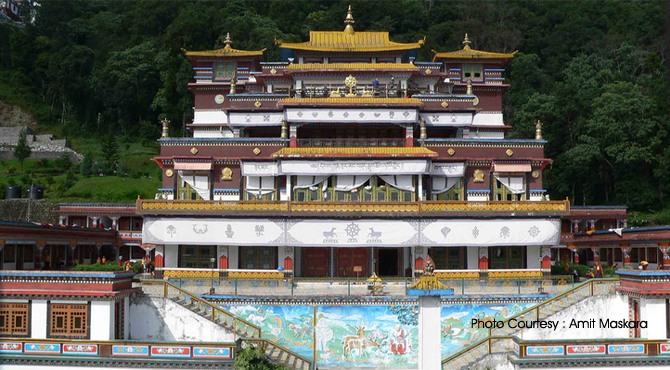 No trip to Gangtok is complete without the visit to Rumtek Monastery. One of the sacred pilgrimage center for Buddhists, Rumtek is the richest buddhist monastic center in india and the largest monastery in Sikkim. Also known as Dharma Chakra Centre it is the headquarters of Kagyu (black hat) order of Tibetan Lamaistic Buddhism. Stands 5500 feet above sea level, it is 24 km away in a picturesque environs on the lower valleys of south west Gangtok, the capital of the Sikkim. When Chinese invaded Tibet, Rigpe Dorjee, the head of Kaguypa (one of Tibetan Buddhism's four major sects) took refuge in Sikkim.The Chogyal (ruler of Sikkim) of Sikkim gifted him some land to established a new monastery and Rigpe Dorjee chose Rumtek as his main seat in exile. Said to be a model of the Tsurphu Monastery of the Kaguypa order,in Tibet, it was originally constructed by the 9th Karmapa Wangchuk Dorje in 1740. Built in 1730, by the ninth Karmapa, it was destroyed and renovatd completely to the present state. It was here late Gyalwa Karmapa lived till the completion of the Rumtek Monastery. The old Rumtek monastery built in the reign of the fourth Chogyal,is a short distance away. It is here, a large community of monks of the Karma Kaguypa order are being trained meditation and the study and practice of Buddhism, which have been taught and practiced for the last 800 years. A fine example of the Tibetan monastic art, it has exquisitely carved wood work, mangnificent thangka paintings and treasures of sacred and rare objects, religious scriptures, the Golden Stupa containing the remains of His Holiness the 16th Karmapa, scriptures of the Kangyur translated from Sanskrit and a Tibetan translation of an ancient Indian religious text which contains 225 volumes. Inside the monastery complex houses a main shrine temple, a three-year retreat center, a Buddhist College called the Karma Shri Nalanda Institute, Karme Dechen Chökhor a nunnery, stupas, a protector's shrine, institutions for the lay community, residential quarters for the monks etc. Spread over an area of about 74 acres, the complex is surrounded by monks' quarters. The main temple is a four storey structure which encloses a spacious stone courtyard. During the festivals monks perform ritual lama dances including the very famous 'Cham Festival' (December) in this courtyard and it draws many visitors during these times. The main entrance of the temple is decorated with traditional colourful murals. It has a golden sculpture (ghanzira) on the roof and five different designs depicting the five Buddhist families families - Amithaba the wheel, Vairochana the bell, Amoghasiddhi the vase, Akshobya and Ratnasambhava the jewel. Huge life size images of the four guardians of the Universe stand guarding the four directions- Virudaka(east), Virupaksha (west), Dhritarashtra(south), and Vaishravana (north). One can also see a painting of Lord Ganesha inside the temple (it is said that Karmapa had a vision in which he saw that Lord Ganesha had blessed the construction of the holy structure ). The Main Hall stands on strong red pillars with long, round silk banners and ancient thankas suspended from them. One can see Policeman on the Rumtek monastery guarding main hall entrance. Inside the monastery walls, is the paintings of the Kagyu lineage, the eight great Bodhisattvas, the sixteen Arhats, the Genduk Chogngi etc. The holy throne of the Gyalwa Karmapa, a large statue of Sakyamuni Buddha along with Shariputra and Mangalputra are positioned. To the right of the main hall are the Mahakala and Mahakali Shrine rooms and on the left side are the two gonkhangs (protector chapels) of Tsering Che Nga(the female protector of the Kagyu lineage) and the deity Dorje Drolo (the wrathful emanation of Padmasambhava). There are institutions under the Rumtek monastery which are located inside or nearby. Karma Choekhor Tashi Ling Lhakhang : A temple dedicated to ordinary monks for practice prayers, mantras and follow other religious activities and rituals. Amidst the Karmae Choekhor Tashi Ling Lhakhang, one can see a pair of large prayer wheels filled with Buddhist texts and many other holy objects. Sungrab Nyamso Printing House : Consists of five thousand hand-carved wooden blocks of sacred Tibetan scripts it prints rare Buddhist texts of the Kagyud lineage. Karmae Dharma Chakra Centre School : It is a primary school which provides free education to children of the monk community and adjoining villages. Garchen Handicrafts: One can get variety of traditional Tibetan carpets from here. Kunga Delek Hotel: The monastery's own hotel situated opposite the entrance to the courtyard. A good hotel with all basic amenities, clean rooms and food. It also provides panoramic view of Gangtok and the surrounding Himalayan Ranges. It is a nunnery founded by His Holiness the Sixteenth Gyalwang Karmapa. Here, the nuns get training in the tantric ritual arts and sadhana practices. The Shedra, or monastic college, was founded by His Holiness the Sixteenth Gyalwang Karmapa to spread teachings of Lord Buddha and Kagyu tradition of Mahayana Buddhism. The young monks and Tulkus are trained in traditional Buddhist education with blend of of modern educational systems. Every year, a dance festival 'Cham Festival' is held here, on the fifth month of the Tibetan Calendar. It is the festival of dance held for two to three days. Mask dances are performed by the Lamas during the festivals. The stories from the life of Buddha & Guru Rimpochi and the demons are depicted in the form of a dance. The dance symbolises the defeat of the demons from the Guru Rimpoche, the victory of good over evil.